When many apps are open on your phone in the background and you have not closed them, then they will work in the background and continue to utilize battery power unnecessarily. When you are enjoying online video streaming where android system handles all background operations along with data connection and streaming leads to more usage of power from the battery. The Video Games played on Android Platform requires an Internet connection and this combination put the heavy load on the battery to run smoothly as gaming includes heavy graphics. An Old Battery is itself responsible for draining of battery power as Android System requires a heavy amount of electric supply which an old battery cannot fulfills so use a new battery as your phone battery gets old. Also, Never use Old Battery in Smartphone. If you are using a mobile cover then remove this cover when your smartphone is overheated because if the heat doesn’t come out, then it can harm the hardware of the mobile phone. When your smartphone is old and doesn’t have the required hardware configuration needed for the new updated Android version then it will work slowly and more battery power will be over in less time. If the Location service is ON in your Smartphone then your battery will be providing more power to the apps which are accessing this service in the background. This results in less power for that app which you are using currently on screen. 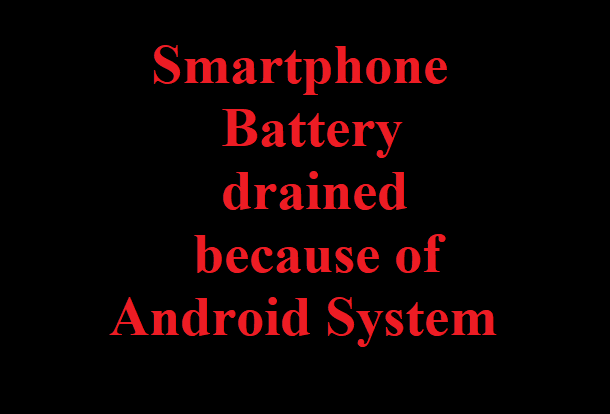 If you want to know more about battery drained due to Android System, then please leave your message in ‘Leave a Comment’ section below.